We interconnected three sites with Cloudy nodes over the Internet. 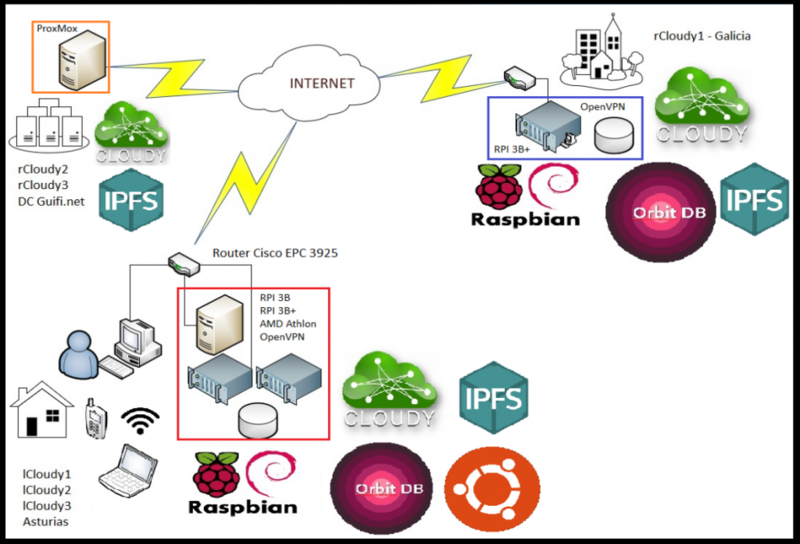 In this setting, we have the situation of a heterogeneous network, with some Cloudy nodes at the same location and others remotely connected over the Internet. IPFS-Cluster was installed on the Cloudy nodes in order to explore the possibility of having a private IPFS network in this environment. We observed some timeout issues with IPFS-Cluster and needed to increase for the Raft consensus protocol some network latency related parameter values in the IPFS-Cluster configuration file. Finally we achieved to successfully connect 7 instances over a heterogeneous network. © Cloudy 2015, licensed under GPLv2.